A rejected lover gave his former girlfriend an unwanted Christmas present – a bucket of cement tipped over her car. Darren Manson crept up to Danielle Black’s motor parked outside her home around 5am on Christmas Day. He texted her saying: “You messed with the wrong man”, then tipped the mortar paste over the bonnet, windscreen and roof. Manson and Danielle, both 20, had split up after a year-long relationship not long before Christmas. Danielle was asleep at her home in Bainsford when her mother, Nicola, was woken by “banging” outside. Prosecutor Samantha Brown said that Mrs Black looked out of the window and saw “an object” being thrown towards her daughter’s car which was parked in the driveway. The depute fiscal said: “She observed the accused running away, and saw a bucket of cement mix lying on the ground next to Danielle’s car. She said Danielle checked her phone and found a number of messages from Manson. Among them, he had texted: “I have so much hatred towards you. Manson was spotted crouching and trying to hide behind a wall in the Blacks’ garden, and the police were called. 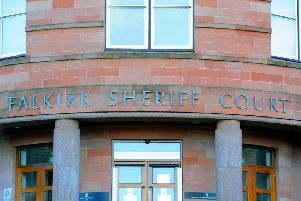 He was arrested nearby and appeared from custody at Falkirk Sheriff Court today after spending two days in police cells. Miss Brown added: “What’s described as ‘the cement paste’ was easily wiped off. Manson, from Falkirk, an unemployed warehouseman, pleaded guilty to using threatening and abusing behaviour. Defence solicitor Stan Quirk said: “They hadn’t long split up, and things were a little raw. Sheriff Robert Dickson deferred sentence for reports, and released Manson on bail to re-appear for sentence on January 26. He imposed a bail condition ordering him to stay away from Danielle until then.